We love dogs! We live in Rochester, NY on 14 acres of land with wooded trails and plenty of birds all around! In 2000 Amy was certified as a professional dog trainer. From there, we started a full service, full time, in home doggie day care and boarding facility. Being exposed to so many different breeds and having the pleasure of having them live amongst us in our home, led us to the wonderful world of Vizslas! We were lucky enough to obtain our first vizsla, Ivy in 2007. From there the AKC world of dog shows, hunt tests, and agility captivated me. We’ve met many friends and mentors in the vizsla world. 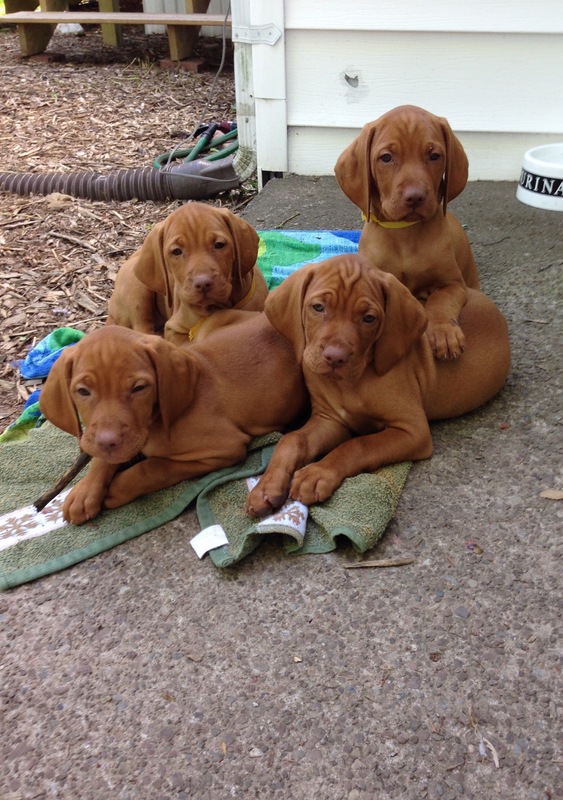 Vizslas fit into our outdoorsy active lifestyle beautifully. We breed very occasionally and selectively. We breed for temperament first and foremost. Both our Vizslas are certified Canine Good Citizens. Ginger should become a Therapy dog this upcoming year. Our dogs are as well behaved as they are beautiful.